Some places in your home are germier than others. Do you clean your stove knobs when you clean the kitchen? If you’re like the average homeowner, the answer is probably not. Stove knobs are regularly overlooked, and that’s probably why one study found that 14 percent of stove knobs have been known to harbor coliform bacteria and 27 percent were found to have yeasts or mold. Remove the knobs and soak them in hot, soapy water once a week. In order to wash your hands to remove whatever bacteria you’ve picked up, you need to actually turn on the faucet. In one study, it was found that five percent of faucet handles carry staph infection, nine percent carry coliform bacteria and 27 percent carry mold. Use a disinfectant wipe or spray on your faucet handles once a week. Kitchen sinks are the hub of every American kitchen, but it’s important to clean your kitchen sink on a regular basis because it’s a hotbed for bacteria. One study found that 45 percent of sinks carry coliform bacteria and 27 percent carry mold. You should carefully clean the bottom and sides of the sink twice a week, and clean the drain and sink strainer every month. Our kitchen counters are where we prepare and sometimes even eat meals, and they are also where we read the morning paper, do our homework and make out our grocery lists. 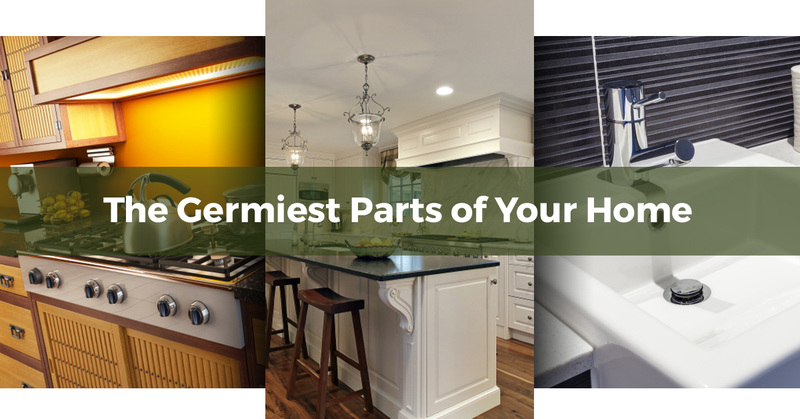 Unfortunately, kitchen counters are also some of the germiest places in American homes. A study found that 18 percent of countertops have molds, while 32 percent of them harbor coliform bacteria. Unless your countertop requires special care, the best way to clean it is by washing it with a solution made of bleach and water after you prepare food. Since toothbrush holders are traditionally kept in bathrooms, in close proximity to the toilet, they tend to be common places for bacteria to form. A study confirmed that 64 percent of toothbrush holders contained yeast and mold, 27 percent had coliform bacteria and 14 percent had staph. If it is safe to do so, wash your toothbrush holder in the dishwasher or hand wash it with hot, soapy water two times a week. There many germy places in your average home, and some of those germs can even make you sick. Luckily, with our residential cleaning services in San Jose on your side, your home will be cleaner and safer. Contact us today to learn more.